Multifunctional Spray Gun Plus Set 26452900 https://www.kaercher.com/ie/home-garden/watering-systems/nozzles-and-spray-lances/multifunctional-spray-gun-plus-set-26452900.html Multifunctional Spray Gun Plus Set with 2 universal connectors (one with aqua-stop)and tap adaptor. Works with all other brands. 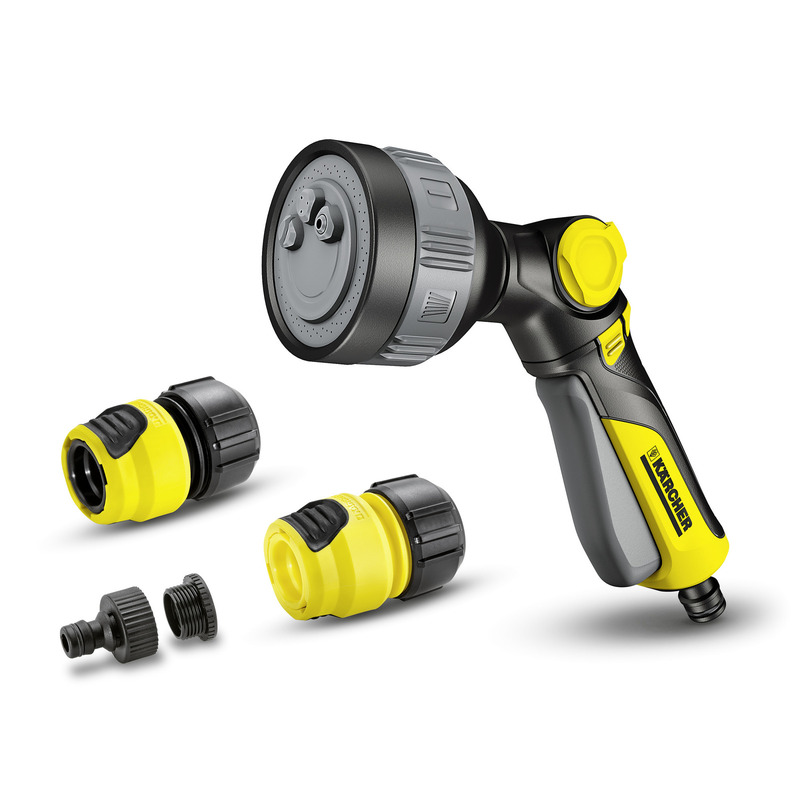 Multifunctional Spray Gun Plus Set with 2 universal connectors (one with aqua-stop)and tap adaptor. Works with all other brands. The Multifunctional Spray Gun Plus Set is perfect for all watering around the garden. The set includes the New Multifunctional Spray Gun (2.645-269.0), a free-flow universal connector, an aqua-stop universal connector and tap adaptor with reducer. With 4 spray patterns, the multifunctional spray gun can be used for watering seedlings with the fine mist, borders with the wide spray and cleaning garden tools with the power jet. The spray gun also includes the innovative dual seal technology, which allows easy switching from one spray pattern to another whilst also being drip free, meaning no water is lost. The new range of Plus and Premium Spray Guns also include the innovative rotating trigger handle. 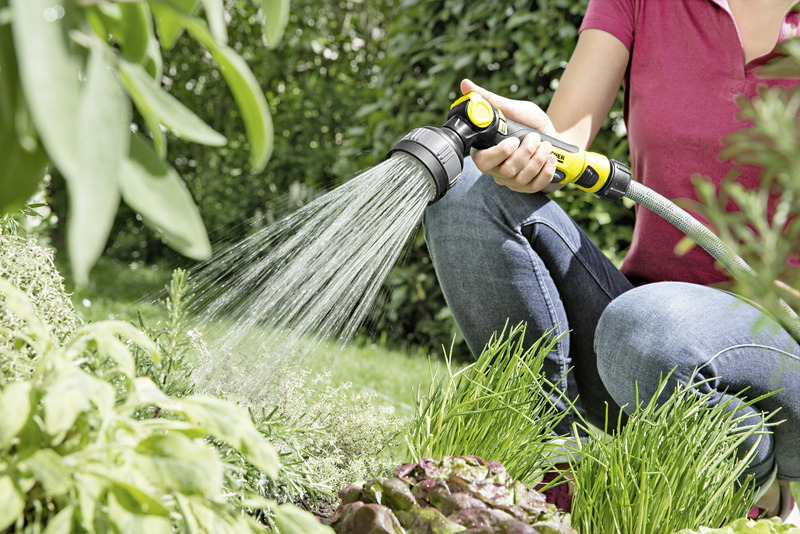 The unique handle allows the user to tailor the watering gun to suit their needs, from either a push or pull operation, ideal for anyone with dexterity issues. All Kärcher watering products are compatible with all other watering brands." Multifunctional Spray Gun Plus Set is rated 1.0 out of 5 by 3. Rated 1 out of 5 by Hicksy from Don't buy!! We have bought two of these, but not long after first use with both, it has come apart at the yellow part, looks like it should come apart, however there is no way to put back together again. Don't buy. Feel very let down by a brand name i thought would mean a good product. Stupidly thought the first broken one was just a rare thing! Rated 1 out of 5 by Annoyed customer from Product is not fit for purpose I used this spray gun for a month and then the end just dropped off during use - completely broken. I bought it due to the brand name and it’s not fit for purpose! Contacted Karcher and they are not interested in the fact that their product is poorly made. Rated 1 out of 5 by Peterpan from Disappointing Bought this to replace the traditional yellow ones you buy from home base,as i expected to be well built. Unfortunately it lasted 1 afternoon with my 12 year son before it was in pieces. Looked and felt like a great product but just don't expect it to last if you drop it on the grass.